Maddison Gibbsand Lisa Roberts,artists with Aboriginal Australian and European ancestry, created this animated message from conversations with scientists and other artists during Living Data residencies at the University of Technology Sydney (UTS) and the Australian Antarctic Division (AAD). This work was supported by the Antarctic Climate and Ecosystems Cooperative Research Centre (ACECRC), The Central Science Laboratory, and private patrons. Students from the Victorian College of the Arts at the University of Melbourne contributed animations in response to Living Data conversationsabout the recent fish kills in the Murray Darling River. and all treaties (agreements) within us, between us and our lands and waterways. 'Rivers of Oz' is part of an animation made with art and data from scientists and other artists, to reflect "the spirit of inclusion and cooperation that's at the heart of the Antarctic Treaty, and that sustained Aboriginal Australia for tens of thousands of years. The time has come to speak out. Stories now are being told through inclusion and cooperation across generations, cultures and disciplines. And thanks to digital communication technology, stories can now seed treaties - or agreements - within our selves and between ourselves, to care for the natural world that sustains us. 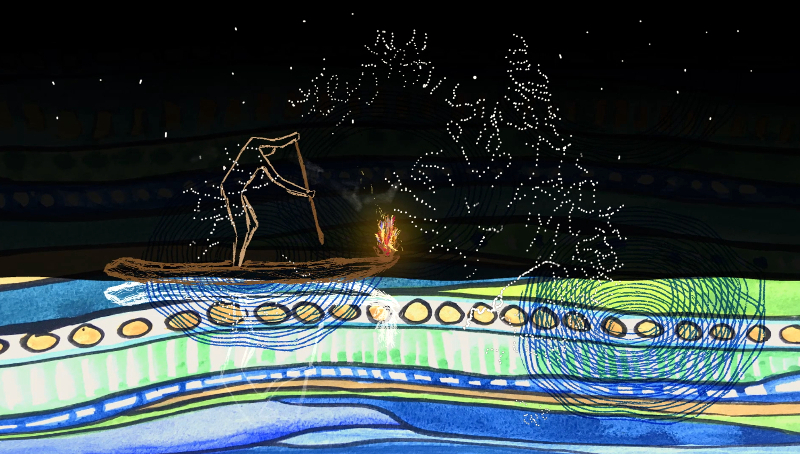 Seeding Treaty is a suite of animations presented as Living Data. Living Data are responses to our changing environment, documented on LivingData.net.au. Animations have been made in the spirit of inclusion and cooperation, with everyone involved creating part of an evolving bigger story about our relationship with nature. Treaties are agreements for growing and sharing knowledge for the common good. For tens of thousands of years, Aboriginal Australia was sustained by the spirit of inclusion and cooperation with agreements reinforced between its peoples through songlines told in ceremonies. This same spirit of inclusion and cooperation is what drove the Antarctic Treaty. I'm not so naive as to believe that this spirit is not undermined by personal greed and institutionalised commercial seductions for us to work against and not with the laws of nature. Humanity is better than that. Truth-telling is better than that. and to other people whose stories won't be muzzled. My experience is that many scientists, artists and Indigenous knowledge holders have sought anonymity, not notoriety and money, instead feeling driven to learn and tell stories for sustaining humanity - physically, biologically, spiritually. The time has come to speak out. Stories now are being told through inclusion and cooperation across generations, cultures and disciplines. Special thanks to William Gladstone, So Kawaguchi, Dana Bergstrom, Andrew Constable and Ruth Eriksen. and implementation of First Nations knowledge. And letting the water flow in. our health - mental and physical. and disregard for Indigenous knowledge. that without one we cannot have the other. to be able to have a valid voice to put forward. Annalise Palenzuela: What is wrong with the water?